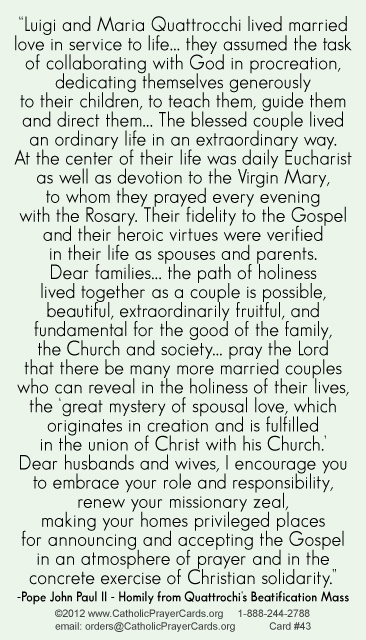 Dear families.... the path of holiness lived together as a couple is possible, beautiful, extraordinarily fruitful, and fundamental for the good of the family, the Church and society.... pray the Lord that there be many more married couples who can reveal in the holiness of their lives, the "great mystery" of spousal love, which originates in creation and is fulfilled in the union of Christ with his Church. Dear husbands and wives, I encourage you to embrace your role and your responsibilities,renew your missionary zeal, making your homes privileged places for announcing and accepting the Gospel in an atmosphere of prayer and in the concrete exercise of Christian solidarity. 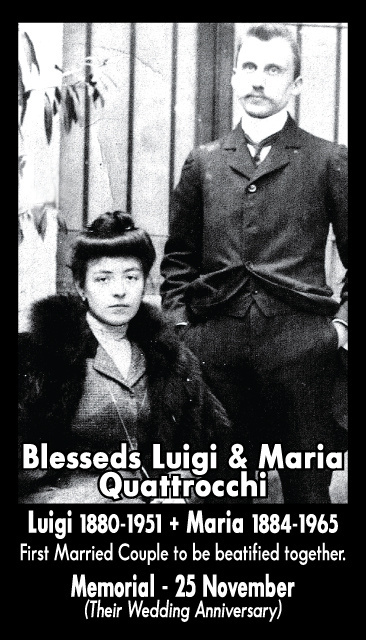 Excerpt from Pope John Paul II's Beatification homily of Luigi and Maria Quattrocchi. -- First married couple to be beatified together.